The CARROT BLOSSOM is the state flower of Ohio. It consists of an umbrella-like head of very small tiny white petals, but what they lack in size they make up in number; and this makes the BEES very happy. CARROT BLOSSOM HONEY has a wonderful aroma, sharper than most and sweet but clear, almost like an exotic wood or even peppery. It doesn’t taste like CARROTS. It has a strong flavor, which will initially impress you as caramel; but then begins the intriguing journey of aftertaste. It’s a little like walking through a flower garden, capturing the fresh crisp aromas of peony and other blossoms. If you really like your HONEY flavor to stand out on foods, this is the HONEY for you. CARROT BLOSSOM HONEY is a great HONEY for cooking. Chefs love it. An executive chef at the Willamette University has recently discovered this HONEY, and has been excitedly experimenting with new recipes (if he is willing we will offer one of his recipes here in the future). This HONEY is really unique and worth a try. Brewers, you will love this one too. CARROT BLOSSOM HONEY is one of the best for making meads and other brews. 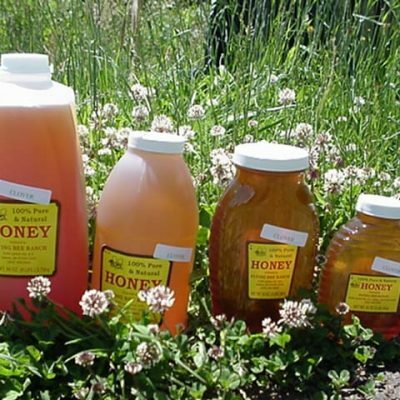 It is an uncommon honey, so brewers cherish it and often guard it jealously. If you haven’t already, try it. It produces a wonderful complex taste, which improves over a few months if you can keep it in the bottle that long.